We’re back with the “What Parents Should Know” series. This entry is ripped straight from the headlines in my own backyard after a pair of bomb threats caused Marblehead High School caused an evacuation. 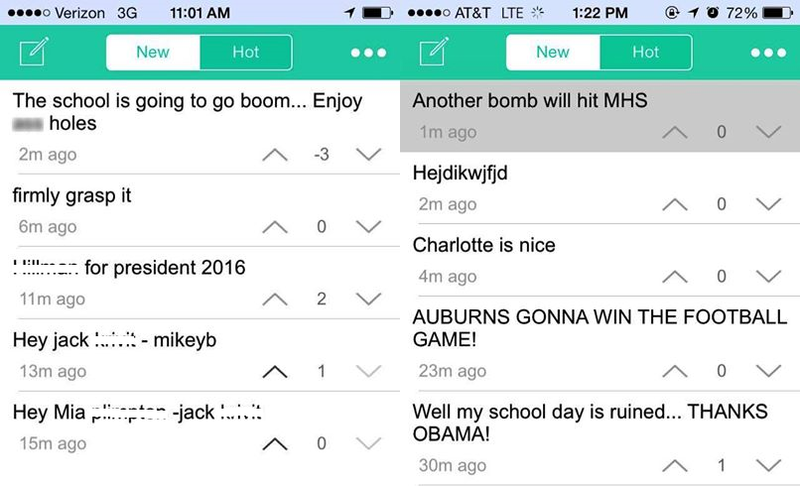 This isn’t the first issue schools are having with the app as rumors of violence and instances of cyberbullying are running wild within the three-month old app. About the App (from the Android Store): Yik Tak is anonymous, local and social – interact with other around you by posting Yaks… With Yik Yak, you can talk about anything and everything- share your stories anonymously… Yik Yak lets you post anonymously or under an alias. As you can see, one of the biggest problems with the app is a user’s ability to remain anonymous. This is allowing people to post anything they’d like without fear of repercussion. Upon downloading the app I quickly learned that users enjoy the anonymity because the app doesn’t require that a profile be set up. Once you have the app loaded you are good to go with posting. The app works off your phone’s GPS, allowing a user to see and be seen by the 500 closest users within a 5 mile radius of your location. Given the lack of profiles on the app my normal method of reporting on an app isn’t going to work so I’m going to bullet point the pertinent information. Age Restriction: the app is limited to users 17 and over or “mature.” However this is moot if age and maturity restrictions are not set on your child’s phone. Content: The app actively encourages users to share anything and everything. It then allows other users in range to “upvote” on the story. While posts are limited to 200 characters this hasn’t seemed to stop users from getting into trouble. Anonymity isn’t real: Police arrested a student after receiving help from Yik Yak to locate user who had posted threatening material on the app. You’re not as safe as you think you are. Reporting Inappropriate Content: The app does allow for users to report inappropriate content. One way is to click the “report inappropriate” button a post. The catch being that it takes multiple reports for the app to take action. Users can also screenshot the content and e-mail it to the developers. While that is all well and good, this will not stop users from bullying or harassing others. As no profile is required for users, all the developers are able to do is remove the current harassing content and nothing more. The screenshot to the right (click to enlarge) are the two bomb threats posted in regards to Marblehead High School. In addition to finding these I found a large number of Yaks that proved that foul language, sexually explicit content, threats, and cyberbullying rein supreme on the app. Given the nature of the problems already associated with the app in its infancy, I wouldn’t recommend allowing your child to download the app to their phone. Utilizing the ability to restrict the maturity and app rating levels your child can download to their phone is key. To assist with this I will be posting instructions on how to do this as soon as humanly possible.